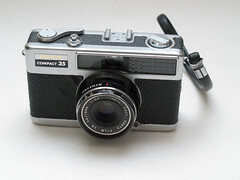 Automatic compact camera with an interesting design produced in 1967 in Japan and it cost 14.900 yen. Very comfortable with the marks to parallax correction. In the viewfinder you will see four icons at the bottom of the viewfinder to focus, on the left side - the size of the aperture and shutter speed time, and the top of the meter pointer. Selenium light meter that controls the correct lighting conditions, in addition to automatic mode, the option to manually set the aperture and shutter speed. The camera works without any batteries! !